Can I just start this off by saying how difficult it was to narrow down the choices for this week’s Jacksonbelle Embellishments challenge? 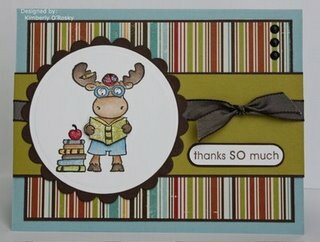 We CASE-d another DT member this week – Kim over at Sunshiny Days. Talk about one talented lady!!! *whew* I get really nervous when I have to case members of any design team, lol! I drooled over her blog (literally – she has some tasty treats on there, too!) for at least an hour before I settled on a card to case. I chose the card from the post titled Riley Sketch, and it is from last Thursday. Here is what her adorable card looks like! How cute is the little book reading Riley? I love it! For my card, I changed up the color scheme a little bit – rather than Chocolate Chip I used Tangerine Tango, and rather than circular Nesties I went with the Labels Two set. Also, I used the Lizzie Anne Designs set called School Days. I used Fancy Pants dp, from their About a Boy line. I just love the rich colors in these papers! I colored my little guy and his books with Prismacolor markers as well as Copics. The apple is popped up on a dimensional, and painted with Royal Red Shimmerz. The books have Pixie Dust Shimmerz Blingz on them – so sparkly irl! I used twill ribbon purchased from Jacksonbelle, but it looks like it is out of stock right now. Stalk her though – she’ll get it back, lol! In the top right corner where Kim placed brads, I put clear epoxy stickers – I love the way they magnify the stripes! Please play along with us this week – the keyword if you upload to SCS is JBE040. 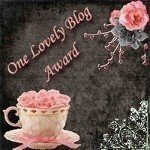 Now, on to the blog candy! Be honest – that is the only reason you are still here, lol! I’m giving away $25 worth of Jacksonbelle products! How fun is that?! I picked out an assortment of Webster’s Pages, Fancy Pants Papers, and Shimmerz for someone to win! Isn’t that exciting?!?!?! All you have to do is play along with us this week. Except I’ll be even more open – pick any member of the Jacksonbelle Design Team and CASE one of our cards. Post a link back here (either to the card on your blog or to an online gallery) in the comment section, and I will draw a random winner! If you upload your card to SCS, use the keyword JBE040A, so I know it is for the extra challenge I’ve issued (and if it happens to be one of Kim’s card’s you’ve cased, use both keywords). You have until next Monday night – February 23rd – at 8:00 EST to link your creations here. Please be sure to give credit where it is due, and say who you CASE-d!! I’ll anounce the winner next Tuesday, when we do our next Jacksonbelle Challenge! Have fun stamping! And don’t forget to stop by the Jacksonbelle Blog, where Kim has created an awesome tutorial for you this week! Links to the other DT members are on my right sidebar – so go leave some love! Awwww, thanks for boosting my stamp esteem 🙂 This is adorable. I LOVE how you used the Labels Nestie and that little boy image is too darn cute! I love your card!!! I love those Labels 2 nesties, and I really like the colors and embellies you choose to use!!! You did a great job on your case!!!! Love it!!!! 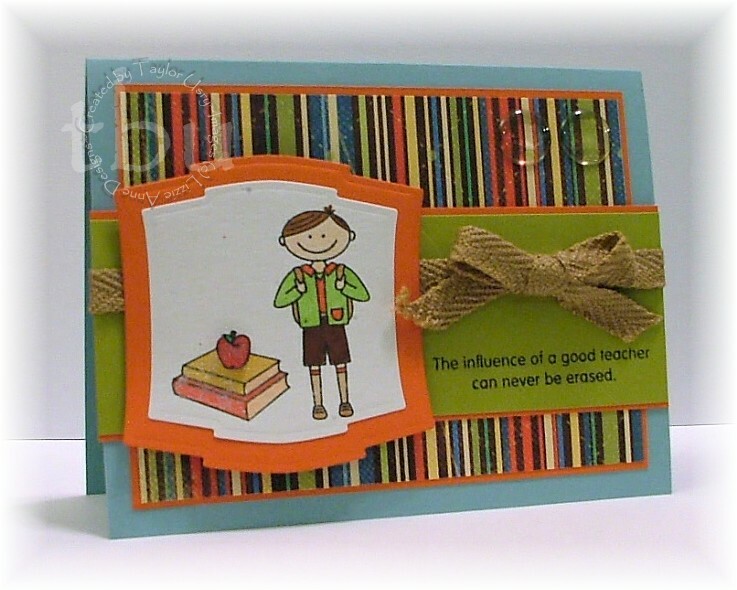 Great CASE…love your card…cute image, great coloring! I love your card ,Taylor. It is so cute. Just might be my favorite for the day! Wow, you did an amazing job on your case! I love the striped paper you used and how you changed the shape of the nestie! Beautiful coloring as well! This is just darling Taylor! You did a great job CASEing Kim! I love the LA image and it is perfect with the Fancy Pants paper! Lovely cards. You do great job. Here is the card I made. I cased Kim. Thanks for the chance to win Taylor!